Today I leave India. Its misty and raining so perhaps India is sad too. I have to admit that I am going to miss it at least a little. The ride to the airport was quick and the driver took me through some very rundown areas. I thought it interesting in one case when we were on a small street with storefronts that clearly looked like they had seen better days; about 10 of the shops were "sweet" shops. Indians sure do like their sweets! The airport in Delhi is not the easiest to navigate. It has wide open spaces, but it isn't clear where to go or what to do. First, you have to have the baggage you are checking scanned. They put a closed band around your luggage and then you go to your airline check-in. By the way, there aren't any signs labeling the check-in counters. After check-in, there is immigration, which is marked well, and then customs. 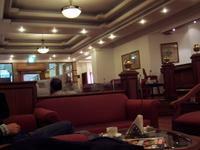 All of this gets you into another lobby area with a few duty-free stores and the airline lounges. You are still not at the boarding gates. You have to pass through a security screening to get to the gates. 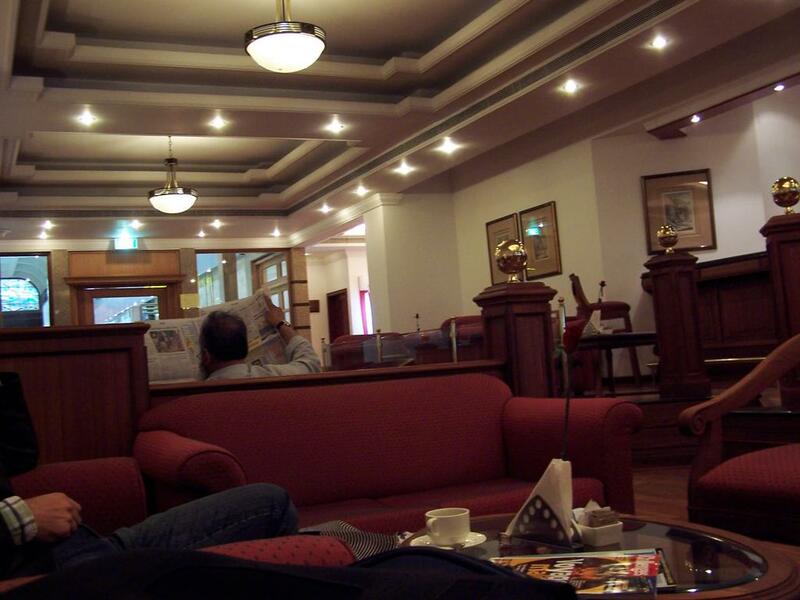 The Clipper Lounge, the area for Emirate Air (and others) business and first class passengers, is nice, quaint, and small. There is no wireless Internet access at the airport but there is a "pay terminal" in the lounge. Simple sandwiches and cookies are the staple food. The smoking portion (yes, they have a smoking area) and the non-smoking area are separated only by a two-foot high decorative railing. I ask myself, "why bother?". I have yet to be in a Business Class lounge that didn't mess up my boarding call. So I decided to head for the gate when I thought it was about the right time. A good thing that I did that too! I was held up at the only staffed security point for almost 20 minutes. First there was a fellow in front of me that was waiting for a colleague, and he wouldn't take his 15 bags off of the X-ray belt, keeping the security staff from scanning any more; but they weren't pressing him to remove them either. I passed through the body scanner okay but they decided to wand me anyway. Then, it seemed that the fellow in front of me needed to have a bag searched, and one of mine was "tagged" for search as well. Despite having six people at this checkpoint, only one was looking at bags while the others discussed a recent cricket match. When the security guard opened this guy's bag and removed a wooden box, there was an 8-place silverware set inside complete with steak knives! This ensued a 10-minute debate between the guard the passenger on why he couldn't carry it on the plane. This guy just did not understand why he couldn't take his knives and forks on the flight! Where has he been hiding? Eventually, after several other people, including a military officer, joined in, they led the man away along with his 14 other bags of stuff. Boarding was a different experience. Emirates boards women and children first -- always. Then boards the usual first, business, and frequent flier passengers. I boarded and got seated. I was pleased to find out they had upgraded me to First Class and I was one of only three people in the cabin. This meant there was a 1:1 ratio of attendants to passengers in First Class. The pilot then announced we would have to delay departure for 20 minutes because the tower had cleared too many inbound flights for landing. When we eventually headed for the runway, I saw at least 40 other planes stacked up to leave Delhi. It almost looked like an airlift. Flying first class on Emirates will spoil you and you'll never be able to fly Southwest again (no disprespect intended). Instead of one or two choices of food you are presented with an entire menu and a complete wine list. Full meals are at least 3 courses, with dinner being 4. And all of the food was terrific! 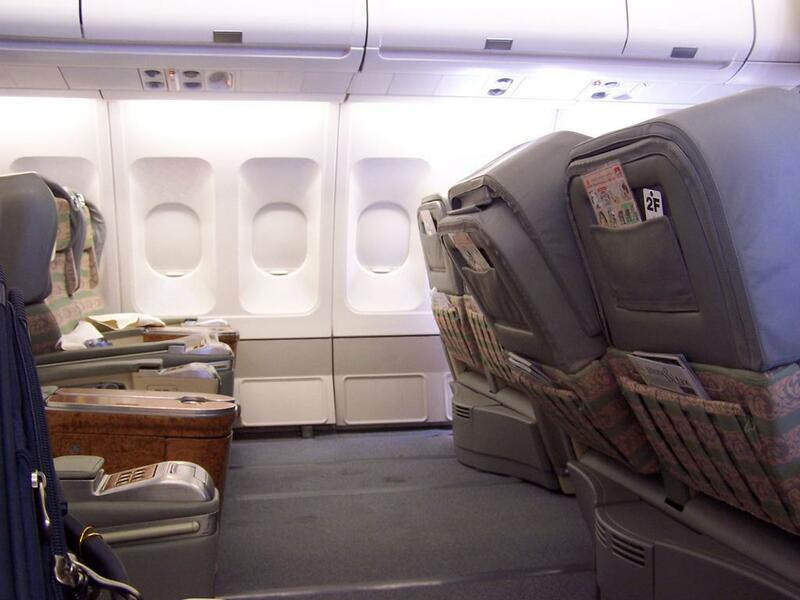 The seats are comfortable with loads of leg room (see photo) and move into all sorts or positions. There is no underseat storage though. 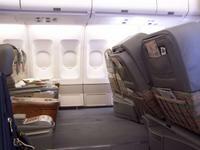 In fact, storage seemed to be a little tight in this cabin as the center seats also had no overhead compartments. Each seat has a video station where you can watch what is on the plane's systems (some TV shows, a few movies), play interactive games like Tetris, or get a tape of a current movie from the flight crew to watch. Between the champagne, wine, and appertif I was feeling pretty good by time we were on final descent into Dubai!